Did you ever notice that the scarecrow has a gun in the Wizard of Oz movie? Hello world! My name is Lila. I’ve got rainbow hair, a small piece of titanium through my right eyebrow, and a neutral facial expression that frightens grown men. My roommates mock me because I like to sit in the dark, and my biggest fear on a day-to-day basis is smelling bad. Anyway, enough formalities. I think that a lovely and productive topic for discussion would be motivation.Oh man, what a nice buzzword, right? Such a well-traveled path of discourse for any career choice. I hardly care to delve into the justifications for being an “artist” or wanting to “create,” as these definitions have broken down into broad, debatable parameters and would make anyone outside of the “art world” gag at the pretension of such particularized abstraction. Instead, I would like to attempt to precisely dissect personal inclination to design. As a wee thing, I found myself fixated on labels and displays in stores. 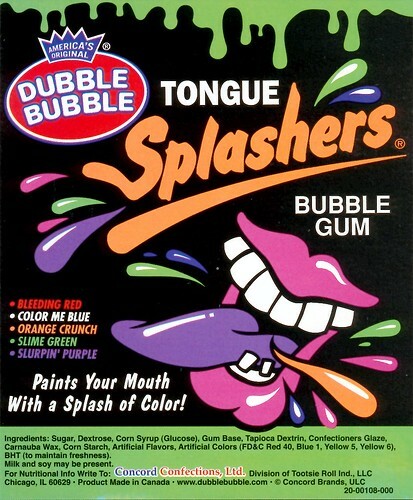 (As I reminisce, the specific image of the Tongue Splashers packaging comes to mind.) I was amazed by the fact that a shiny bag with pretty colours could draw me in and make me want whatever was inside, even if closer examination proved my complete lack of interest in the product. I was entirely content to simply stare at the glossy printed cardboard and ponder the appeal while my mother shopped. In clothing stores, there would often be no flashy boxes or plastic bubble packages to amuse me, so I instead would sit and poke my fingernails, bemused and intoxicated by the way the nail bed turned from pink to white then back again with the application of pressure. The checkout lines at grocery stores were my favourite. The shelves full of tabloids and candy and impulse-buy items were my primed canvas. The cashier’s eyes would flick over to me with vague worry as my dearest mother would seemingly disregard her four-year-old near so many small items with pages to be ripped or sugary contents to be consumed. True to this very day, I had little to no interest in cheap confections or the lives of the socially elevated. I instead wanted nothing but to fix these few cubic metres of the world: to right all of the wrongs in this one area. So I began my work. I tugged each package of Skittles to be as smooth and uniform as possible, and then I carefully lined and stacked them to look just as they should in an advert. Every pack of Trident and Wrigley’s had to be all parallel and perpendicular to all the right axes, just as the person who created the packaging had intended, for maximal spacial efficiency. Even after my mother had received her receipt, crinkling bags of consumables, and her change, I could not leave my post until everything was in its most organized and appealing place. Ah yes, sweet satisfaction it was indeed. My mom would roll her eyes with affection and sarcasm as the cashier would often chuckle at my strange hobby and designated determination. There are pictures of me from when I was in pre-k, from a particular day when I was playing with these little plastic shapes. Each shape was geometrically regular, and all of the sides of each shape were equal in length to those of all the other shapes. Thusly, they were able to mix and tessellate. I had created a few patterns with different combinations and arrangement of shapes when my teacher came by. Her jaw dropped as she witnessed the complexity and precision of my little floor creations. She demanded that I do not change a single one while she scuttled away to find her camera. I was also required to leave them as and where they stood until the day was over so that my parents could see my work. Leaving the mess out after cleanup was agonizing. My elementary school art teacher let me sit and work at her desk when she saw that I actually managed to give two shits about her class, and how much the interruptions and intrusions of my less-motivated table-mates upset and distracted me. Later middle school and early highschool brought with them the preambles of the explosion that is social media. With this came the requirement of frequent and thorough documentation of ones appearance. I still have yet to master naturalistic facial expressions, and puberty had smacked me upside the complexion. The discovery of Corel Photo Paint on the communal family computer was like that of some kind of religious awakening. Whaaaaat? I can un-pizza my face? I can make my eyes greener? I can make the world more colourful and high-contrast? Sweet merciful technology, this was gorgeousness and gorgeousity made flesh. Contrary to my expectations, this did not make me any less socially undesirable, but my time was too blissfully occupied and passed with scrubby sliders and masks and gaussian blurs to notice too much. Again in middle school, I was pulled from the flock of my art classes with three other hand-selected students to work on a mural for the hallway, rather than drawing landscapes or plastic fruit or extreme-perspective roadways. Apparently I had some kind of elevated ability. I just assumed that I had consciously decided to put effort into my classes. I was being graded, I knew I was capable of making quality work, and I came to school for the purpose of learning, so why would I choose not to? That would be an illogical waste of time. Then came high school. With my electives filled by Spanish and orchestra, I basically disregarded “art” for three years. My agenda was filled not with assignments, but with extensive doodles and patterns expressing the purest moments of boredom in classes that were too easy and slow. I had given up on trying to dress like the people of middle school who had friends, and instead based my personal aesthetic on others who I would see and promptly envy solely on the basis of their appearance. There was a senior in my lunch period named Scott who was in a punk band. He wore only black and white, sewed his skinny jeans to be absolutely skin-tight, and bleached sections of his black hair to white in different, immaculate patterns every few weeks. Needless to say, I was infatuated in every sense. I realized that I could wear three shirts at once, each of a different pattern, cut, and colour, and by golly, it was not flattering, but it was fabulous. The introduction of hair dye to my life was nothing less than monumental. In my junior year, I wore a different costume every Friday, because I love the concept of costumes, and I had the capability and resources to do so. (My AP Lit teacher absolutely lost it when I came in as Hester Prynne, complete with a doll and sparkling “A” on a floor-length dress.) That year, I had an entire page in the yearbook dedicated to my appearance. For senior prom, I knew that I would never find “the perfect dress” that would fit both my body and my funds, so what choice had I but to make my own ensemble (gee, I was so hard to spot in a crowd.) Yes, the top is made of duct tape, yes, those shoes are seven and a half inches tall at the heel, and yes, I was a runner-up for prom queen (worry not, I was homecoming queen the year before, and won the yearbook superlative for “most unforgettable.”) My psychology teacher literally jumped back in surprise when she entered the room and saw that I had chosen to don blue lipstick. Anonymous schoolmates on the internet made such claims that they too could stand in their closet in the dark and clothe themselves with complete disregard for coordination or ideas of tackiness. I just laughed and laughed, knowing how dang GOOD I looked. Once my schedule had openings, I filled those with the required “intro to art” and Sculpture I. The former was taught by an obnoxious spacey stereotype who complained that perfume gave her migraines, and asked me to stop wearing any (see the fourth sentence of this post.) She also held strong to the claim that red, yellow, and blue were the true primary colours. Needless to say, we did not mesh well. However, I maintained a 100 in the class, because I could. My sculpture teacher, on the other hand, was delighted to have a mentally engaged student. I worked at his desk instead of with other students, while he and I heatedly debated absolutlry anything that came up. He liked to argue, and I liked to humour my teachers. He gave us weekly sketchbook assignments, promising that he would be checking and grading them every Friday. I completed each one by its designated due date, but soon realized that he didn’t actually care that much, and usually checked the bulk of them at the end of the semester. I had none of that, and on a weekly basis would literally shove my work upon him demand that he evaluated my efforts so that I could be both internally and externally validated. Another 100 on my report card. When the list of fourteen students accepted into the Graphic Design emphasis for the Spring of 2012 was taped to the door of N215, and I had realized in my anxious panic of waiting that I had no other backup major, no alternate life I could pursue, my heart stopped as I watched Ms. Roberts walk back to her office. I dashed to the piece of paper on the door and instantaneously sobbed thrice as hard as I did when I met Patricia Quinn at Dragon*con the year before (and that was pretty dang hard.) I saw my name there and that meant that my life was moving forwards and that I would be who I was supposed to be and never again have to wear navy blue Abercrombie & Fitch shirts and grey pants in an effort to feel like I had a place and a function on this planet. I was verbally incoherent for an hour after that as I shook and sobbed on the bridge that connects the North and South wings of the second floor of Lamar Dodd. I’m not frequently overwhelmed by emotion, so when it rains, it pours. I love this and appreciate this Lila. I cannot say that my description of why I am here and how I got here would be quite as eloquently put. This may contradict valid motivation to some, but in the simplest way I am motivated by the opportunity to improve people’s lives. Sounds silly and vague, yes I know. It’s like this—yes, I can paint, yes I love form, and yes I love stories; but not one of those things is a leader to what really motivates me to create. I want to know that I made something that satisfies and helps someone else (in one way or another). Not many people know that I failed kindergarten because I was too busy watching my fellow classmates interact with one another and too preoccupied by task of perfectly coloring inside of the lines on my worksheets. They said I was “slow”, so I got held back. I have a vivid memory of the year after kindergarten. The teacher asked, ‘Would anyone like to read the next line?’. I practically leapt out of my chair with so much excitement at the opportunity. My teacher said, ‘Okay Hannah!’. I look down only to realize that none of it meant anything to me. I realized for the first time that I could not do something that everyone else could. So of course, my natural response was to forget it and obsessively draw. The only reason I went to the library was to check out drawing books so that I could give my teachers doodles. So if I couldn’t read, and I could grasp the concept that the ‘letter’ 8 was a quantity, how did I survive and not get bogged down? I had other things on my mind. Apart from obsessive amounts of drawing and stealing my sisters cursive homework to trace it, I was the adventurer and the ‘helper’ in the class room. I noticed when the bathrooms were dirty and cleaned them for my teacher, I noticed when a student was lonely at recess and hung out with them, I showed people the correct way to color and lent them my things. I stepped in when others where arguing to explain to them that the issues could be fixed and reasoned through. So yes, that was the 7 year old Hannah, but the 22 year old Hannah is still the 7 year old as lame as that sounds. I continued to do these things as I got older, and yes I finally learned to read and do math (though not very well). I continued to make art all the way into high school. By the time senior year rolled around, I decided that I didn’t want to go to college. I loved fine art, and thought I was damn good at it, but something about it was not motivating me. Making art became a task. So I decided, culinary school! That didn’t happen due to how ridiculously expensive it is. Eventually my parents convinced me and due to late decisions I ended up an art major at a military school. Can you imagine the struggle!? At this point I still had no idea what graphic design really was, I just knew that the cadets I was arguing with in class were ignorant idiots. I spent copious amount of time and energy explaining to and arguing with ignorant people about the inability for society to exist without “art”. I would mention things as their i phones, architecture, signs, ect. What I didn’t realize was that what I was really talking about was design. Society NEEDS design. It fired me up, and once I realized what I was talking about, I knew that that was exactly what I wanted to do with my life. Long story short, I transferred to UGA and here I am now! A Successful design process takes more than the ability to create form. I think that the designer must be able to stop, see, and try and understand the things around them in the world—and yes this means actually interacting with people. This is speaking to design in a broad sense, but I think as young Graphic Designers we can forget this. I know that I can. Whatever may motivate you, be motivated. It’s so easy to forget that each of us has a wildly different and complex background story. We hardly notice the differences between ourselves in the cohort because all of our paths literally lead us to the same place. You want your design to serve others, to improve their lives, whereas I selfishly desire to organize chaos and manipulate minds for my own satisfaction. It’s quite the sonder to ponder! These were great to read. We’re lucky to come from such a diverse group of peers- not many other schools can say that. Regardless of the local culture, and that many of us come from georgia, we all have our own individual makeup that we bring to the table. I’m happy to have a reminder that the people around me have so much to teach me about. Sometimes I forget how lucky I am to be able to do (mostly) what I want to do. I love what I do. I love what we do. I love talking about it. I love thinking about it. Sometimes, though, I also forget that other side- that side that makes me so mad, frustrated that I can’t make what I want to make when I want to make it. The sides of my daytimer are filled with notes on ideas of things that I want to make, right then and there. Sadly, almost no one has the ability to drop everything that they’re doing at any given moment to create what they want to make. Nothing terrifies me more than the idea that I will run out of time, resources, and money to do what I want to do – because essentially all that I want to do is to make things that matter. It makes me angry how badly I want to make things sometime. But that’s the best part- I am lucky to have the capacity to care about what I do so much that I get frustrated. Motivated. Sometimes they’re on the same terms. And I will be making things for the rest of my life- so i’ve got time. It may seem unrelated, but we’re very lucky to have (for the most part) a structure that allows us to “make” and learn. We get to go to a pretty cool facility that has people that want to talk about making. But what makes me mad is the idea that i’m going to run out of time. I’m not sure what this fixation with time is. But one of these days, maybe i’ll figure it out. Nothing makes me consider how good i’ve got it like thinking about how many people slip through these cracks of time, and get set aside at such a young age. The idea that I was able to develop these interests with such encouragement is something that I think of often. If I could have a hand in changing this for another person, then I would. One day I will probably have the opportunity to bring another person into finding out what makes them as motivated as I am. I hope so. My need to make things that matter is a feeling that I think everyone deserves to have. We can reevaluate what matters and make changes that better the world around us. We can all get angry about something that we care about so much.